Vyvyan Holland was born in London 1886 under the name Vyvyan Oscar Beresford Wilde. He was the son of the notorious author and playwright Oscar Wild, imprisoned and convicted of the charge of "gross indecency" due to his homosexuality in 1895. After a very public court case, Vyvyan’s mother, in an attempt to protect her boys, moved them abroad and changed their names. Having first moved to Switzerland, Vyvyan was soon on the move again and enrolled in an English-speaking school in Germany. However, he was unhappy there, so was then moved to a Jesuit school in Monaco. 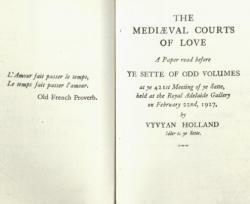 Vyvyan studied law at Trinity Hall in the University of Cambridge from 1905-1907. He resumed his study of law at the age of 22, and was called to the Bar of England and Wales by the Inner Temple in 1912. He then began to write poems and short stories. This little book was privately printed in 1927 for members of Ye Sette of Odd Volumes, which was an English bibliophile dining club founded in 1878 in London by the bookseller Quaritch. ‘The Sette’ remains today a small private social club dedicated to book collecting, printing history, and bibliophilia. The book in our collection was produced on handmade paper, and is part of a limited edition of 13 copies of which this one is no.10. 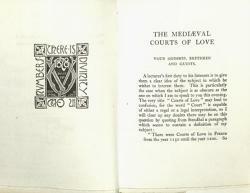 The title ‘The Mediaeval Courts of Love’ refers back to the love debates that took place in courtly circles in France in the twelfth and thirteenth century, the period known for the development of chivalric ideas, love poems sung by troubadours and trouvères (minstrels), and the rise of medieval romance. In matters of love women were at last recognised as having some measure of control in where their affections lay and how they were treated. The courts were run by women passing judgement on issues pertaining to love, fidelity, chivalry, curtesy and good manners. 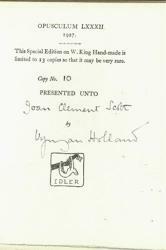 The book is dedicated to Actress Joan Clement Scott and signed by the author. Within the pages a letter in the author’s handwriting to Joan Scott was found. The letter is in the form of an apology for failing to attend an engagement; the author then offers the book by way of a peace offering. Joan Clement-Scott was born on April 23, 1907 in Marylebone, London, England as Joan Isabelle Footman. She was an actress, known for her roles in Cæsar's Friend (1939) and Shall We Join the Ladies? (1939). She was married to David John Footma and died on May 13, 1960, in Chelsea, London. Vyvyan Holland went on to serve his country as a Second Lieutenant in the Interpreters’ Corps, but later transferred into 114 Battery, XXV Bde Royal Field Artillery during the First World War. After he was demobilised in 1919 he was awarded an OBE. He then had a successful career as an author and translator before being offered a position as a translator and editor for the BBC at the start of the Second World War. Vyvyan died in London in 1967 aged 80. The book belongs to the Flintshire Harries Arthurian Collection, which came to Bangor University Library in 2014 and now forms part of the Centre for Arthurian Studies (Arthur.bangor.ac.uk). It is kept in the Rare Books and Special Collections at Bangor University Library and can be seen at the Archives on request.